You want Divergent to be a better movie than it is, if only for its up-and-coming young star, Shailene Woodley. With its Twilight franchise gone and nearly forgotten, Summit Pictures has been grooming a couple of Young Adult novel adaptations as potential money-making successors. The first, Ender's Game, was a complex, male-oriented sci-fi war picture burdened by the troublesome politics of both it and its author. The second, Divergent, has the luxury of showcasing a new female star even more appealing than Jennifer Lawrence, the lead of its most successful rival, The Hunger Games. It's also helmed by possibly the most talented director a YA movie series has attracted yet, Neal Burger (The Illusionist). Even with all of these winning components in place, Divergent still feels half-baked. The problem lies in the simplistic source material. Veronica Roth's science fiction novel posits a future in which a new society has sprung up in a post-apocalyptic Chicago that has isolated itself behind an improbably large fence that surrounds it. This culture is divided into five factions: the altruistic Abnegation, the placid Amity, the honest Candor, the heroic Dauntless and the logical Erudite. Tris Prior (Woodley) is the daughter of two Abnegations (Tony Goldwyn, Ashley Judd) who is fast approaching her Choosing Day. At that time, she will be tested to see whether she conforms to the personality shared by her faction or that of another. No matter what the result, on that day she is given the opportunity to decide what faction she feels she truly belongs to. This comes at a crucial time when Erudite and Abnegation are in contention over whether the latter should really be running their government. 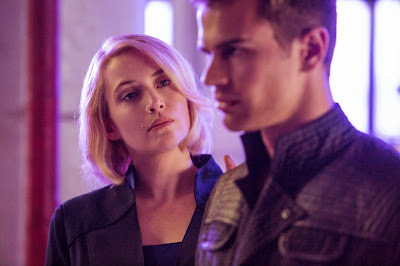 Tris's test results are problematic though. She comes up as Abnegation, Dauntless and Erudite. In other words, she's Divergent, a troublesome, independent class of person who is often disappeared or sent to live with the Factionless. She decides to hide her results and throws in with Dauntless, the civilization's protector class and the group where she is most likely to attract the attention of Jeanine Matthews (Kate Winslet), the Erudite leader trying to reform things in her favor. Elements derived from science fiction classics as diverse as Logan's Run, Starship Troopers and more fuse to create a sort of Cliffs Notes version of dystopia, a background against which the likable and dynamic Woodley plays out the usual YA fantasy about finding your voice and deciding to stand out from the overwhelming peer pressure to conform. Perhaps due in part to Burger's involvement, Divergent offers some of the most exhilarating moments of self-actualization yet seen in these often bland YA films. You know that thing your parents used to say to you, "Well, if your friends jumped off a bridge, does that mean you would, too?" Tris goes from being one of those lemmings—in this case jumping off future-Chicago's moving elevated trains just to get into Dauntless' home, an otherwise impregnable fortress—to enlisting her Divergent trainer, handsome Four (Theo James), into her efforts to stop Erudite from executing her former clan, Abnegation. In between, we experience the sheer thrill of zip-lining through Chicago's half-demolished skyscrapers, a nighttime cat-and-mouse game of "Capture the Flag," and a hallucinogenic psychological test used to ferret out the most personal fears of those being initiated into Dauntless, all firsthand through Tris's eyes. Burger superbly puts us in Tris's place in all of these sequences. The engaging Woodley never fails to convey the sheer wonder Tris feels even when in danger, a response that is totally in keeping with her character's emergence into the wide world of adulthood after a sense of confinement she felt growing up in a community where she just didn't fit in. It's too bad, because Woodley's talents are wasted here. Despite these powerful moments, however, Roth's allegory feels didactic and forceful, never fun in a science fiction film. Worse yet, its authoritarian society is cobbled together from that of any number of stories we've heard or seen before. No doubt, a lot of it is deliberately left sketchy in order for subsequent movies to fill in later. But this is quite futile if the series never makes it out of the starting gate. Divergent feels derivative. This might be its most curiously wrongheaded move, because for a movie arguing so strongly in favor of nonconformity, Divergent is about as bland and typical a box office hopeful as you get. Of interest: Now available on VOD, Blu-ray, DVD, and also opening in Atlanta today for an exclusive engagement at AMC Southlake is Dark House. 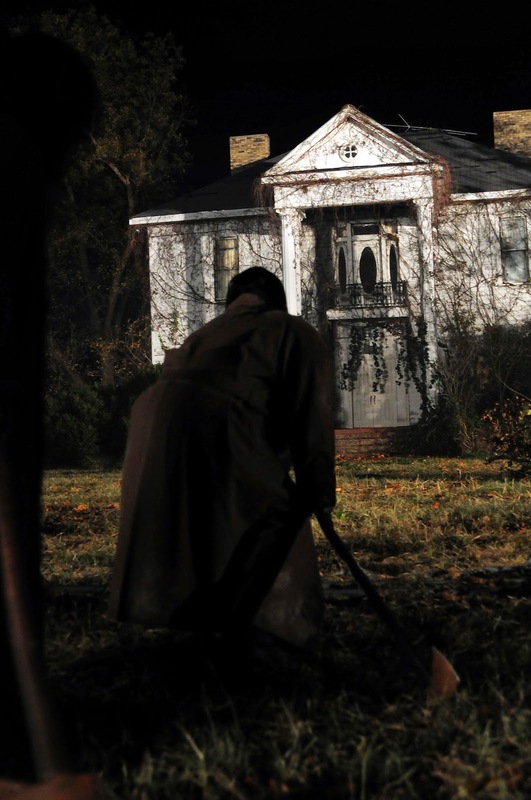 Starring and produced by creepy actor Tobin Bell (Saw), Dark House is a thriller about a young man and a frightening old house that has survived decades awaiting the return of its prodigal son. It is directed by Victor Salva, director of the disturbing Jeepers Creepers franchise. i actually never read the books, and don't want to after seeing this movie. i also thought woodley was a poor choice for this character. i don't think she ever really got a grip of Beatrice. I totally agree that the movie is bland and doesn't explore any of the themes it claims to embody. The generic quality of the authoritarian regime is something I noted in Hunger Games as well (at least the 1st & only one I've seen). Too bad, particularly here, as the multiplicity of personalities and complexity of the social system could lend themselves to an interesting depiction of power and organization. I'm wondering if there is a YA film adaptation out there which gets the dystopia thing right. I think there's a book, at least, which does so - The Giver, with its deceptively calm & gentle elders & self-brainwashing society (although that book has rencroticized too for being too broad or generalized in its depiction of a future/alternative society, but I disagree). Incidentally they have tried to make a movie out of that one for 20 years without success. Last I heard Jeff Bridges was involved I think, and it was in pre-production last fall. We'll see. Some central conceits/deceptions are very literary in form so a cinematic incarnation has it's work cut out for it. Indcidentally, is Winslet riffing on Hillary at all? It seemed so in the trailer I saw but maybe that's just the go-to model/reference for female authority characters (at least in contemporary American films) and no commentary is intended. Too bad Woodley's underused, as she was very good in The Descendents.